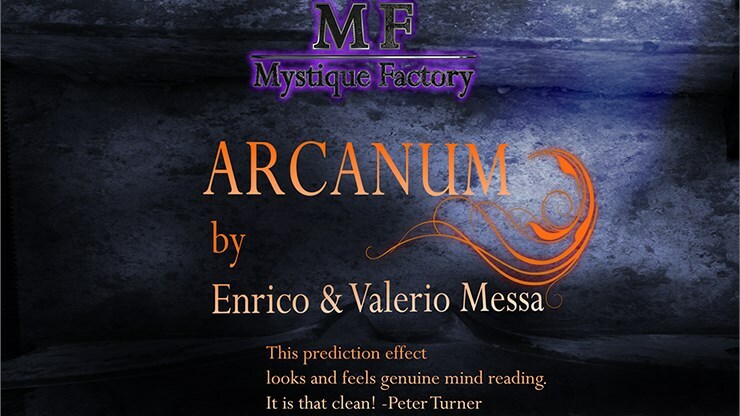 Arcanum is an insane card prediction where your spectators have the cleanest most fair selection possible. The mentalist gives a prediction to the spectator before anything happens. The magician shows that every single card has a completely different word on it. The spectator can stop on any card and it will match with the prediction every single time. Yes that's correct. The spectator will have a completely free choice. Arcanum comes with 4 routines. The Messa Brothers included a bonus routine called Medieval Monte which is the same as the Three Card Monte but it does not use any sleight of hand whatsoever and you will win every single time. Or if you want to use it as a prediction, like you predict in which round you or the spectator is going to win, you can do that too. Arcanum comes with a special deck that does all the work for you. This deck is completely self working.